It’s been a bit under 60 days since AngelList announced Syndicates. What do we know so far? Is it really the great venture capital rotation that @jason described? Is AngelList becoming the democracy of funding with successful entrepreneurs funding new founders, angels gaining strength and big bad VC’s pushed to the side? Turns out, not really. Amidst the defensive VC jabber that ensued the launch of syndicates, @bfeld made a bold move and launched an FG syndicate. Whether Brad tipped the tide or was just a leading indicator, VCs are now playing heavily on AngelList. It is a low cost way to participate in seed deal flow. But not only are VCs seeking participation, capital is actually seeking them on AngelList. Turns out would-be syndicate members are drawn to professional managers. Go figure. The chart below shows the top 20 AngelList Syndicates as of Nov 5th (note that #1 Kevin Rose has added $400K since then!!!). The distribution of syndicates has a VERY long tail, so these top 20 account for a whopping $8.1M out of $9.9M total. 9 of these 20 are what I call “VC” syndicates – led by a VC or general partner at a venture fund. The rest tend to be successful entrepreneurs. On a capital basis, 49% is “VC” and 51% is “entrepreneur”. Note that there are three Google Ventures GPs in this top 20 – Kevin Rose, MG Siegler, and Wesley Chan. They account for 31% of the syndicate capital. Wow… seems like a pretty strong competitive funding position for Google Ventures, a smart – and likely concerted – move. As usual, Google is everywhere. The point is that many of the same investors that companies meet with in fancy Sand Hill digs are now cruising for love on AngelList. There are also, of course, renowned entrepreneur angel investors like Tim Ferriss, Dave Morin, Jason Calacanis, and Naval Ravikant who are heavily empowered by the platform too. This is all a terrific outcome for entrepreneurs, increasing the flow of capital to startups and reducing the transaction costs of landing capital. Contrary to the buzz, however, AngelList is also a boon for VCs who choose to ride the wave… as we can see by Google Ventures’ market position. Even my own fund, Hyde Park Venture Partners, dipped a toe with my partner @iraweiss backing FG’s syndicate. We don’t have enough brass, time or capital to do one ourselves, but we’re excited to learn with Brad. There’s something else these data are telling us. Investing successfully in young companies takes expertise, time and access. The capital is flowing to people who are “proven” along these dimensions – in many cases VCs – not just any angel investor. 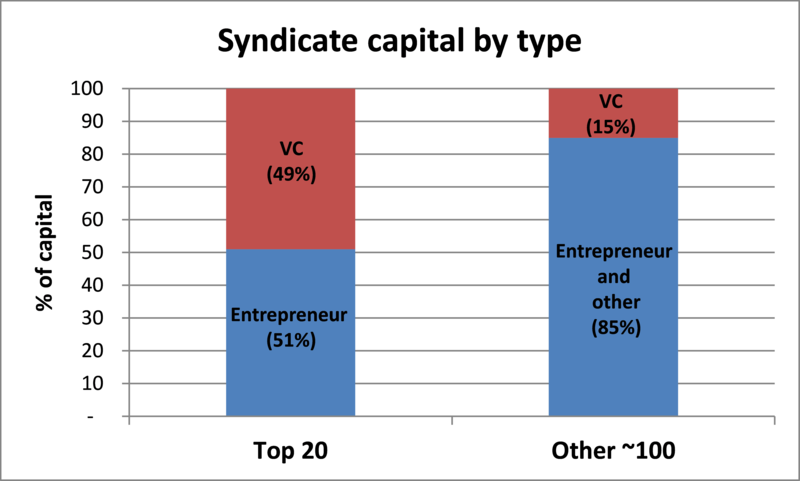 Shown below, while nearly half of the top 20 syndicate capital is “VC” led, only 15% of the tail capital fits this bill. 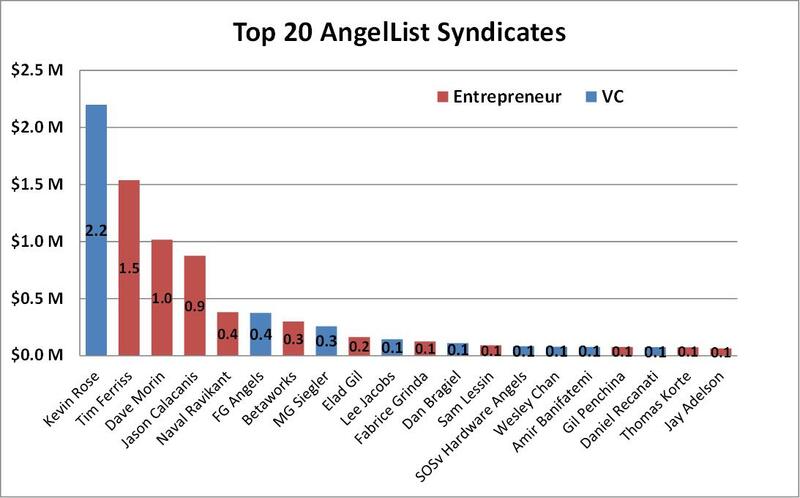 Viewed through another lens, successfully formed syndicates (the top 20 all have at least $60K in capital, the tail median is a measly $12K) are much more likely to be VC led. Maybe we should call it VCList.co. I’ll have to check GoDaddy for that. For all you haters: Yes, I am a VC. I get it, I’m biased. The analysis also isn’t perfect because it only looks at syndicate formation, not capital velocity. Impact to startups could skew differently than the formation distribution if, say, the “entrepreneur” syndicates invested more often than the “VC” syndicates. But I think you get the point.